The Waterford Branch holds its AGM at May 11th at the Edmund Rice Heritage Centre, Barrack St Waterford. The meeting starts at 7.30 pm sharp. We have invited the environmental reps. who sit on various Local Agenda 21 bodies to attend and identify local environmental issues that need to be addressed. Please come along. We will also have present a representative of the Avon Wildlife Trust who is based in Bristol. 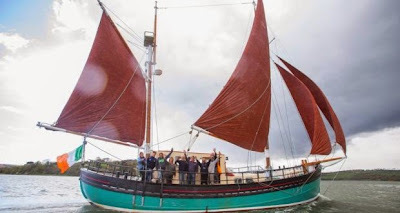 On Sunday May 24th , Waterford IWT offers a two -hour sailing trip in Waterford Estuary. Grace O'Sullivan operates the Brian Boru, a 65' ketch rigged, fully licenced sailing vessel, with Tony McLoughlin. She will be our guide for the trip. The Brian Borus has a spacious deck-house which accommodates all passengers. Grace will tell us about the ecology of this rich and historic body of water. Maximum number of participants for this unique experience is twelve. The trip is being offered at a special IWT rate of €20 for members and €25 for non-members on a first-come basis. Please reserve at woodhouseduo@gmail.com asap. The trip starts at 2 pm.